We have launch new site - POVJP.com. The promo starts on 04.10.2015 and ends on 04.12.2015. Depending on the program you use we will pay $75 PER SALE or 100 % RevShare! IDOLBUCKS AMPS UP YOUR CHRISTMAS PAYOUTS! High Quality Promo Materials And Christmas Sets starring genuine Japanese models are coming to you straight from the land of the rising sun. has all the authentic Japanese video your traffic craves and is busting out a gift of $55 PPS! Promo starts on December 24, 2014 and ends on December 25, 2014. 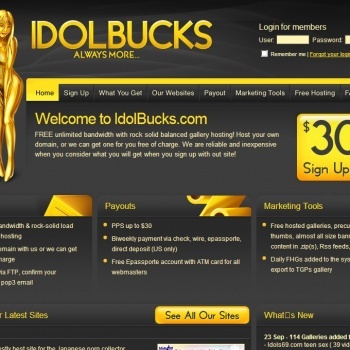 IDOLBUCKS AMPS UP YOUR CHRISTMAS PAYOUTS! High Quality Promo Materials And Christmas Sets starring genuine Japanese models are coming to you straight from the land of the rising sun. has all the authentic Japanese video your traffic craves and is busting out a gift of $55 PPS! Promo starts on December 24, 2014 and ends on December 25, 2014. $55 PPS FROM EVERY SALE! Make even more money during the Christmas with $55 from every signup earned during this promotion, as your traffic turns into money on top converting IdolBucks tours. Payments made via your preferred method with Paxum, bank transfers, paper checks and alternative payouts available. JAV is one of the last unsaturated markets in the industry and your traffic is ready to earn you a very Merry Christmas and profitable New Year!